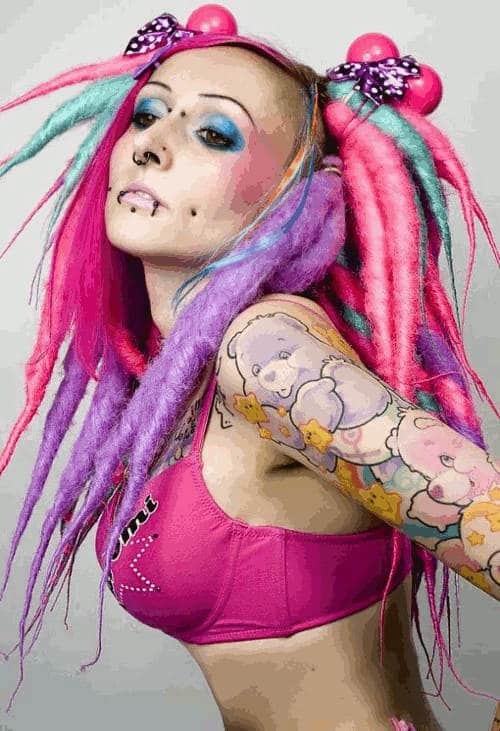 Septum piercings are not visible, unlike having a tattoo. The thin wall in between your nostrils is known as the nasal septum. 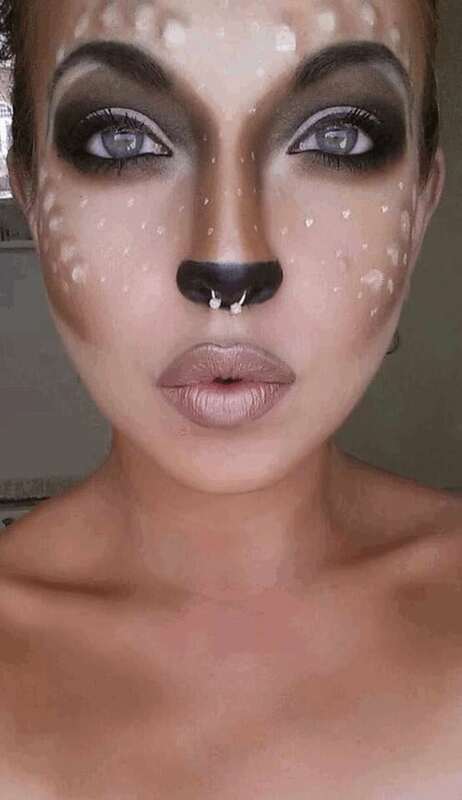 The piercing will be done on the soft spot just below the nasal septum. Septum piercing is also known as bull piercing, this is because this piercing looks like the rings found on the nose of the bull. Several celebrities everywhere such as Lady Gaga, Jessica Biel, and others are currently enjoying this unique type of piercing. There are two types of septum piercing, these are the real septum piercing and the fake septum piercing. If the fake septum piercing is not working for you then you can choose the real septum piercing. 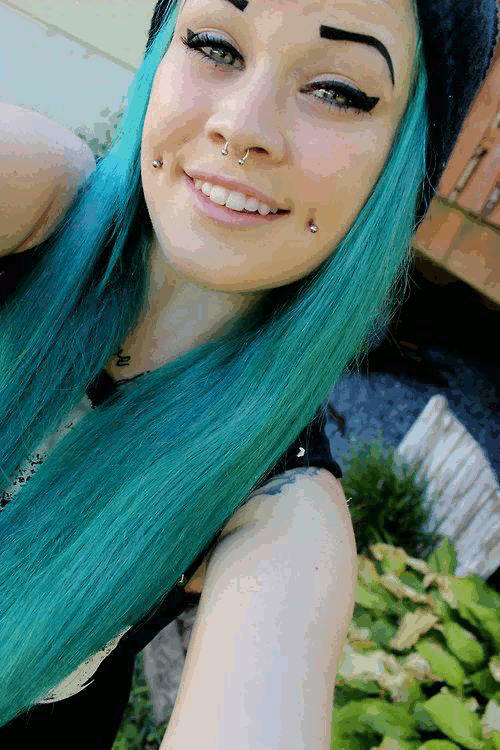 Just like any other type of piercing, septum piercings also requires extra care in order to avoid any infection. Getting a septum piercing is an easy procedure compared to the other types of piercings. The needle will go through the soft spot of the skin in the middle of the nostrils. According to some people, they can feel a strange sensation during the procedure. Sometimes you will experience watery eyes which can make you feel like you want to sneeze. However, it is not a painful procedure. The first thing that the piercer will do is to clean the area where the septum piercing will be done. In order to guide the piercer, he will mark the area for proper placement. Most often the piercer will place his/her gloved fingers inside your nose so that he can feel the right spot. For some piercers, they will let their client sit on the chair but others prefer to let them lie flat on the table. The head should hang at the tip of the table in order to give the piercer a better view. In order to decrease the pain and numb in the area, the piercer will clamp the nasal septum. The piercer will then insert the needle in the soft spot which is just below the nasal cartilage. During this time, you can feel a slight pain which can cause your eyes to water. The piercer will remove the clamp and then insert the jewelry. Sometimes a small amount of blood may appear but there’s no need to worry. 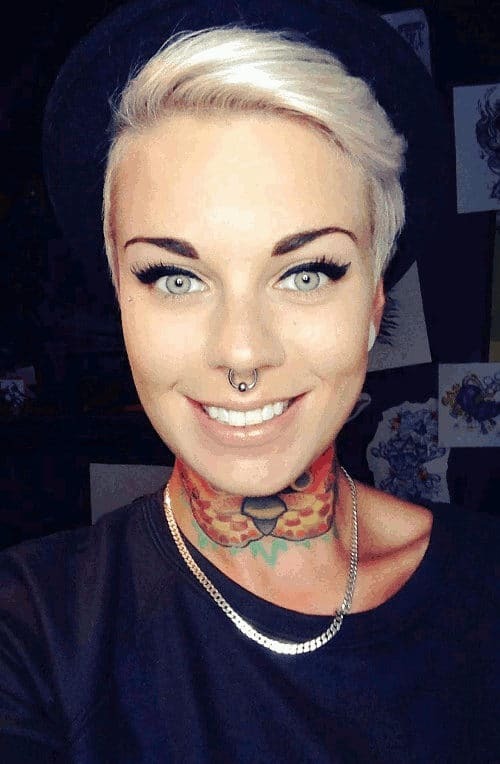 It is recommended that an NRT will be used for the septum piercing in order to avoid crooked piercing. The piercer should use special septum forceps in clamping the area. The clamp should be placed accurately in order to have a successful procedure. If you want to hide your septum piercing then you should select a circular barbell. Make sure that the jewelry is not too big because it can make you feel uncomfortable. 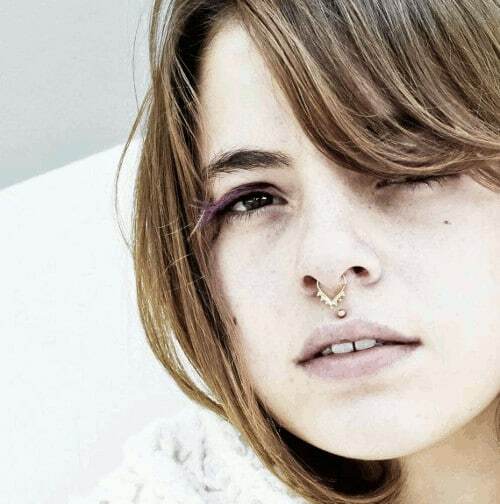 After your septum piercing, you can choose a septum retainer so that you can feel comfortable in breathing. This type of jewelry can help you in getting accustomed to the piercing. After one month, you can replace it with your preferred jewelry. The most commonly used septum piercing jewelry is the captive bead ring. 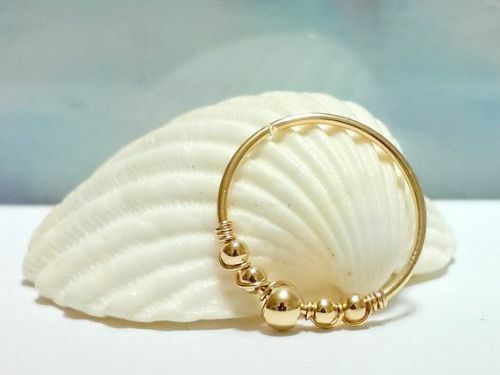 This metal ring consists only of one bead. It looks attractive and secure as well. There are various lengths and gauges that you can choose from. The most popular choice among the youth is the seamless nose rings. 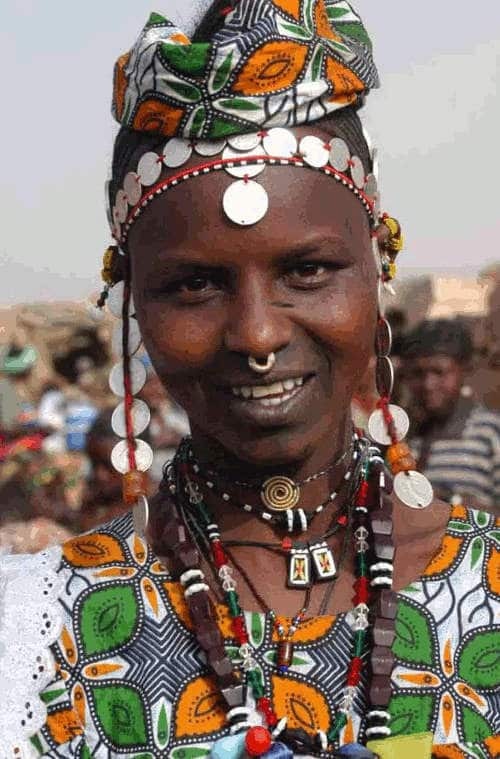 However, you can only wear this type of jewelry when your septum piercing has been healed completely. Most people choose the barbells. There are two types of barbells, these are curved or straight. Curved barbells may look like the captive bead rings however, it is not a complete circle. Sometimes it is also known as horseshoes because of its appearance. This is the best choice if you want to hide your septum piercing because you can easily flip it into your nose. 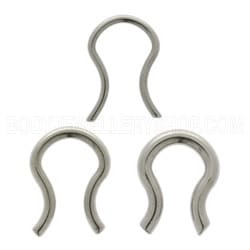 Another type of jewelry that you can use on your septum piercing is the crescents/pinchers. This jewelry is more visible compared to the circular barbell and captive bead rings. 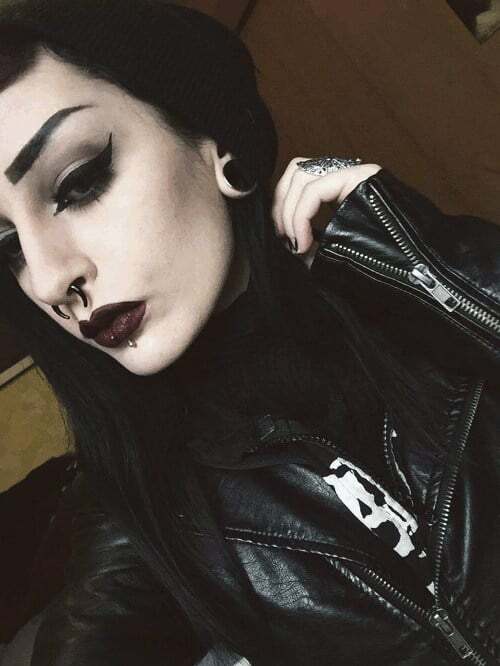 The size of your jewelry may depend on the size of the needle used in your septum piercing. For instance, if your piercer used a 14g needle then you can choose a 16g jewelry. However, it’s also fine to choose a 14g jewelry. The most common size is 14g but you can choose a smaller one which is 16g. It’s actually up to you. Septum piercing jewelry can cost between $3 to $98 depending on the size and the type of the jewelry that you choose. If you love septum piercing but you do not want to experience the pain then you can make a fake one. Rihanna is one of those celebrities who are using a fake septum piercing. Some people could not believe that Rihanna could dare to use a fake septum piercing. Using a fake one is also perfect for people who are sensitive to metals. 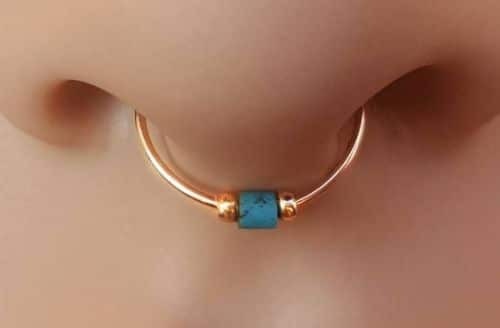 If you are not yet sure if you want to get a real one then you can choose to make your own fake septum piercing in the meantime. The first thing that you must do is to select the type of septum piercing that you like. 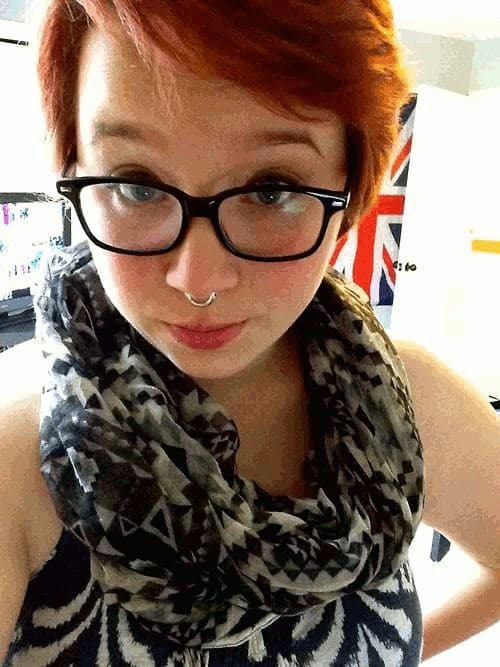 There are actually two kinds of fake septum piercing. The first one is the crescent barbell ring. The curve goes downward and it has an opening at the base of the nose. Each end consists of beads or studs. This type of ring requires a strong glue. Another type of ring is the complete circle and it does not require any glue. Choose the size of the ring that you want to use for your fake septum piercing. In making a crescent barbell piercing, you need pliers in order to bend the stud earring and turn it into a half circle. Do this on the other stud earring. Put the two stud earrings side and side and check if it looks like a full circle. Make some adjustments by using the pliers. When it’s done, dip the tip in a small amount of glue and place in inside your nose. Make sure that it is completely glued to the septum. Do the same on the other side of your septum. In removing the piercing, you have to twist it a little bit to make it lose. In making a full circle piercing, you need one inch of wire and a pen. Roll the wire on the pen in order to form a half circle. Use pliers to pinch both ends. Make sure that it is parallel and the gap is suitable enough so that you can easily slip it into your nose. Using a scissor, snip both ends if you think that it is longer. You can also place a bead by threading it through the wire. When you wear your ring, the bead will hang at the center. Make sure that the ring fits accurately without feeling any pain. The twisted septum is one type of fake septum piercing that looks elegant. Although it may seem that you need to blow your nose but it can make you look trendy just like Rihanna. Zoe Kravitz wore her fake septum piercing nicely and it compliments her grunge look. She wore a detailed ring which is quite unique. Lady Gaga’s fake septum piercing is very suitable for her punk rock style. Some people did not notice that Jessica Biel was wearing a fake septum piercing at the 2013 Met Gala. It was perfect for the theme of the event. It will take some time before your septum piercing will be completely healed. That is why it is important to take good care of the piercing. Clean the area using a mixture of sea salt and warm water. Do this at least twice a day. If there is a formation of crusts in the area then be sure to remove it by using the septum piercing aftercare sea salt mixture. During the initial swelling, you might notice that the piercing becomes a bit slanted. There’s no need to worry because it will likely disappear when the septum piercing aftercare swelling is gone. Avoid touching the area most of the time because it can get infected. Too much washing is not advisable since it can make the area extremely dry and can lead to irritation. By following these simple septum aftercare, you can easily take care of your septum piercing as it heals. Always keep it clean by following proper nose piercing septum aftercare. It can help in keeping your piercing heal quicker and avoid any irritation or infection. Septum aftercare pain can also be prevented. The best aftercare for septum piercing is to keep the piercing area and jewelry clean. Use a saline solution or septum aftercare salt water in cleaning your piercing. Do not twist the jewelry since it can rip and irritate the tissue. Stay healthy by getting enough sleep and eating the right kinds of foods. If you want to blow your nose, then do it gently. Septum piercing aftercare swimming should be avoided. One of the best ways to clean your new septum piercing is to use a saline solution. There are a lot of ready-made solutions that are available, however, it is very easy to make your own at home. In making your solution, be sure to use sea salt. Some people prefer to use table salt. This might work, however, this is not highly recommended since it contains minerals. You should also avoid using Epsom salts since it contains magnesium sulfate and not sodium chloride. You should use Recovery Piercing Aftercare Sea Salt in making your saline solution. Take 1/4 teaspoon of sea salt and mix it with 8oz (250 ml) of warm water. Make sure that the water is not too hot since this can aggravate your new piercing. Using extremely hot water might burn you. Let it cool until it is warm enough. Submerging your septum piercing completely into a glass of water might be difficult, however, if you can find a glass that permits you to, then go ahead and soak it for about 5 to 10 minutes. If this is not possible, then you can use a disposable paper towel and compress it on the piercing. However, you should not apply too much pressure on it. After you have finished soaking your septum piercing, be sure to rinse it with clean, cold water. Use Dr. Piercing Aftercare swabs in removing any discharges or “crusties”. 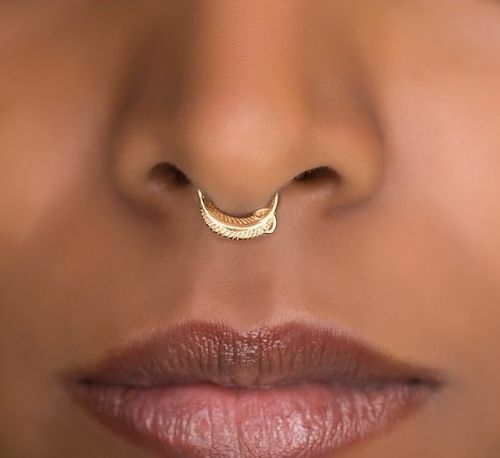 This can thoroughly clean, soothe, and protect your septum piercing. Additionally, it can help in preventing any infection and encourages natural healing. In order to keep your septum piercing clean all the time, you should mist it with a high quality saline rinse like Recovery Piercing Aftercare Spray. This should be done three to six times a day throughout the healing process. Do septum piercing aftercare salt soak two times a day for the first few weeks. This H2Ocean Piercing Aftercare Spray is entirely made of natural ingredients. Best of all, it can work on any skin type. It is advisable that you should use this spray right from the start of your healing process so your piercing can heal faster. It can also help in minimizing the pain. When applying lotion, cream, moisturizer or any facial products on your face, be sure not to touch the septum piercing. The septum piercing healing period may take between 10 to 12 weeks. However, if you want to change your change your jewelry then you can do it after a month. You can even do it on your own. Never attempt to remove the ring unless the septum piercing has been healed completely. If you will remove the ring then the hole will be gone permanently. When sleeping, try to sleep on your back so that the ring will not get caught in the pillow. When drying your face, make sure that the towel is not get caught in the ring. Avoid using alcohol when cleaning the ring and the area because it can lead to irritation. 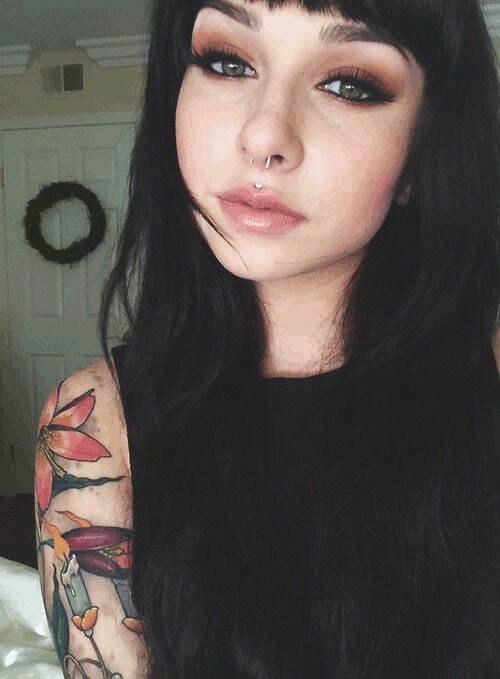 The septum piercing has become more and more popular nowadays. In fact, it has turned out to be a trend, especially among the youth. 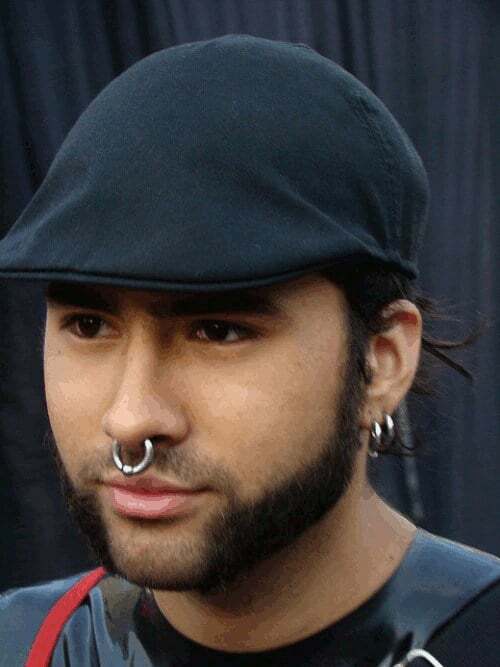 When somebody sees that friends are getting a septum piercing, they are easily convinced and inspired to get one as well.